Honda has been the world’s largest motorcycle manufacturer since 1959, as well as the world’s largest manufacturer of internal combustion engines measured by volume, producing more than 14 million internal combustion engines each year. Honda surpassed Nissan in 2001 to become the second-largest Japanese automobile manufacturer. As of August 2008, Honda surpassed Chrysler as the fourth largest automobile manufacturer in the United States. Honda is the sixth largest automobile manufacturer in the world. Honda was the first Japanese automobile manufacturer to release a dedicated luxury brand,Acura, in 1986. Aside from their core automobile and motorcycle businesses, Honda also manufactures garden equipment, marine engines, personal watercraft and power generators, amongst others. Since 1986, Honda has been involved with artificial intelligence/robotics research and released their ASIMO robot in 2000. They have also ventured into aerospace with the establishment of GE Honda Aero Engines in 2004 and the Honda HA-420 HondaJet, scheduled to be released in 2011. Honda spends about 5% of its revenues into R&D. From a young age, Honda’s founder, Soichiro Honda (Honda Sōichirō) (November 17, 1906 – August 5, 1991) had a great interest in automobiles. He worked as a mechanic at a Japanese tuning shop, Art Shokai, where he tuned cars and entered them in races. A self-taught engineer, he later worked on a piston design which he hoped to sell to Toyota. The first drafts of his design were rejected, and Soichiro worked painstakingly to perfect the design, even going back to school and pawning his wife’s jewelry for collateral. Eventually, he won a contract with Toyota and built a factory to construct pistons for them, which was destroyed in an earthquake. Due to a gasoline shortage during World War II, Honda was unable to use his car, and his novel idea of attaching a small engine to his bicycle attracted much curiosity. He then established the Honda Technical Research Institute in Hamamatsu, Japan, to develop and produce small 2-cycle motorbike engines. Calling upon 18,000 bicycle shop owners across Japan to take part in revitalizing a nation torn apart by war, Soichiro received enough capital to engineer his first motorcycle, the Honda Cub. This marked the beginning of Honda Motor Company, which would grow a short time later to be the world’s largest manufacturer of motorcycles by 1964. The first production automobile from Honda was the T360 mini pick-up truck, which went on sale in August 1963. Powered by a small 356 cc straight-4 gasoline engine, it was classified under the cheaper Kei car tax bracket. The first production car from Honda was the S500 sports car, which followed the T360 into production in October 1963. Its chain driven rear wheels point to Honda’s motorcycle origins. Bayerische Motoren Werke AG pronunciation (help·info) (BMW) (English: Bavarian Motor Works) is a German automobile, motorcycle and engine manufacturing company founded in 1917. It also owns and produces the Mini marque, and is the parent company of Rolls-Royce Motor Cars. BMW produces motorcycles under BMW Motorrad and Husqvarna brands. In 2010, the BMW group produced 1,481,253 automobiles and 112,271 motorcycles across all its brands. BMW AG originated with three other manufacturing companies, Rapp Motorenwerke and Bayerische Flugzeugwerke (BFw) in Bavaria, andFahrzeugfabrik Eisenach in Thuringia. Aircraft engine manufacturer Rapp Motorenwerke became Bayerische Motorenwerke in 1916. The engine manufacturer, which built proprietary industrial engines after World War I, was then bought by the owner of BFw who then merged BFw into BMW and moved the engine works onto BFw’s premises. BFw’s motorcycle sideline was improved upon by BMW and became an integral part of their business. BMW became an automobile manufacturer in 1929 when it purchased Fahrzeugfabrik Eisenach, which, at the time, built Austin Sevens under licence under the Dixi marque. BMW’s team of engineers progressively developed their cars from small Seven-based cars into six-cylinder luxury cars and, in 1936, began production of the BMW 328 sports car. Aircraft engines, motorcycles, and automobiles would be BMW’s main products until World War II. During the war, against the wishes of its director Franz Josef Popp, BMW concentrated on aircraft engine production, with motorcycles as a side line and automobile manufacture stopped altogether. After the war, BMW survived by making pots, pans, and bicycles until 1948, when it restarted motorcycle production. Meanwhile, BMW’s factory in Eisenach fell in the Soviet occupation zone and the Soviets restarted production of pre-war BMW motorcycles and automobiles there. This continued until 1955, after which they concentrated on cars based on pre-war DKW designs. BMW began building cars in Bavaria in 1952 with the BMW 501 luxury saloon. Sales of their luxury saloons were too small to be profitable, so BMW supplemented this with building Isettas under licence. Slow sales of luxury cars and small profit margins from microcars caused the BMW board to consider selling the operation to Daimler-Benz. However, Herbert Quandt was convinced to purchase a controlling interest in BMW and to invest in its future. It is reported that about 56% of BMW-brand vehicles produced are powered by petrol engines and the remaining 44% are powered by diesel engines. Of those petrol vehicles, about 27% are four-cylinder models and about nine percent are eight-cylinder models. Mercedes is not a name of Spanish origin,referring to a title for the Virgin Mary, “Our Lady of Mercy“. Racer Emil Jellinek (1853-1918) used to race with the pseudonym “Mercedes”, after the affectionate nickname he gave his daughter. He later adopted it as his surname, changing his full name to Jellinek Mercedes. Jellinek went on to help develop the Mercedes (car) car company. Audi AG (Xetra: NSU) is a German automobile manufacturer, from supermini to crossover SUVs in various body styles and price ranges that are marketed under the Audi brand (German pronunciation: [ˈaʊdi]), positioned as the premium brand within the Volkswagen Group. The company is headquartered in Ingolstadt, Germany, and has been a wholly owned (99.55%) subsidiary of Volkswagen AG since 1966, following a phased purchase of its predecessor, Auto Union, from its former owner, Daimler-Benz. Volkswagen relaunched the Audi brand with the 1965 introduction of the Audi F103 series. The company name is based on the surname of the founder August Horch, his surname meaning listen in German—which, when translated into Latin, becomes Audi. The four rings each represent individual car companies that banded together to create the union. On the 14th of November 1899, August Horch (1868–1951) established the company A. Horch & Cie. in the Ehrenfeld district of Cologne, but because dispute between him and the supervisory board, he had to leave the company. A few years later, he established a second company, Horch Automobil-Werke GmbH. 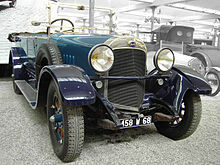 The company traces its origins back to 1909 and August Horch. The first Audi automobile, the Audi Type A 10/22 hp (16 kW) Sport-Phaeton, was produced in 1910 in Zwickau.